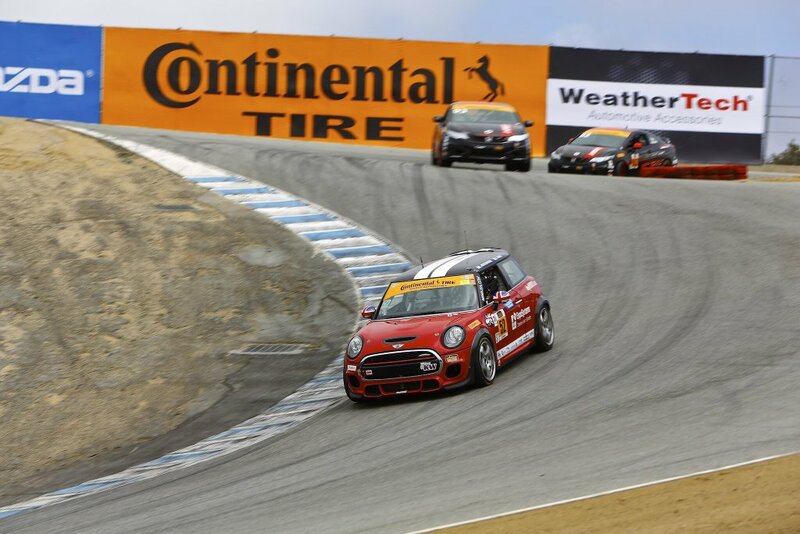 The MINI JCW Team will head to Monterey California for the ninth round of the Continental Tire SportsCar Challenge. The team still maintains a one point lead in the manufacturers standings for MINI after the tough event at VIR. The WeatherTech Raceway Laguna Seca 120 will feature two hours of intense racing around an 11-turn, 2.238 mile course situated in a dry lakebed. WeatherTech Raceway is highlighted by its signature cork-screw turn. The blind up-hill approach combined with the twisting 18 meter drop is a challenging feature that creates some exciting racing. The MINI JCW Team will once again feature three MINIs on the track. The 52 of Mark Pombo and Colin Mullan will look to rebound after having their victory at VIR taken away post-race due to a technical infraction. The good news was that the pit crew and strategy were on point, and they should have no trouble repeating that performance at Laguna Seca. Mat Pombo and Mike Lamarra are still alive in the driver’s championship after a third place finish at VIR in the 73. They’ve had good speed all season and a strong run at Laguna Seca would really help them in their championship hopes. Nate Norenberg and Derek Jones round out the MINI JCW Team lineup in the 37. With two races to go their still looking for their first victory of the season. They’ve had some promising runs lately a will look to build on them this week. If you’re headed to the track on Saturday be sure to head to the MINI JCW Team paddock at 12:30 for the team Meet and Greet. There will be a raffle during this time for Hot Laps and MINI Swag. Sign up with a MINI Representative in the team paddock on Friday or Saturday morning. Winner must be present at the Meet and Greet to win. MINI USA will be providing snacks and soft drinks in the corral on Saturday. The WeatherTech Raceway Laguna Seca 120 will take place on Saturday, September 8th at 6:15 PM EST. You can watch the race live on IMSA.tv, or on the IMSA mobile app. Qualifying will be on IMSA radio and you can keep track of timing and scoring for all events at scoring.imsa.com. The MINI JCW Team, operated by LAP Motorsports (@lapmotorsports), drives MINI’s most powerful Hardtop ever in the two-door John Cooper Works. The team competes in the fiercely competitive IMSA Continental Tire SportsCar Challenge. For additional information please visit minijcwteam.com or email luis@minijcwteam.com.